As you might have noticed I've been cutting back on my book buying. It's been tough, but I've largely succeeded with the exception of some pre-orders here and there. One of the main reasons for this cutback (aside from my TBR-mountain) is that I have run out of bookshelf space. I'm working on getting a new bookshelf made, but that seems to be taking far too long. 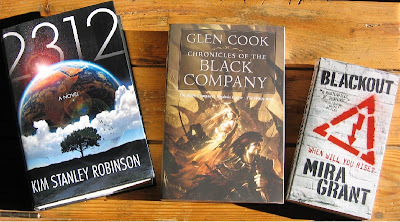 2312 by Kim Stanley Robinson and Blackout by Mira Grant were pre-orders I placed at the start of the year. I also got The Chronicles of the Black Company by Glen Cook which is the first omnibus edition in the series. I already have the fourth omnibus, The Many Deaths of the Black Company, so I'm trying to get my hands on the rest. 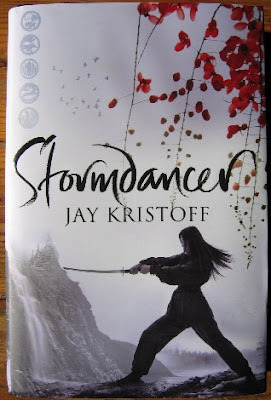 Pan Macmillan SA sent me the absolutely gorgeous hardcover edition of Stormdancer by Jay Kristoff for review. I absolutely love the cover and I can't wait to get to it once I catch up with the rest of my TBR pile. Thanks Kelly! In Orson Scott Card’s Ender’s Game we never got the complete backstory of how humanity found itself in a situation so desperate that it became acceptable to use children in war. There were hints and brief references to the Formic Wars, but the details were largely left to the readers’ own imagination. In Earth Unaware, co-authored by Orson Scott Card and Aaron Johnston, we finally get to see how it all began. Buckle up, double-check your spacesuit, clip on your lifeline and prepare yourself - the buggers are coming and it’s going to be one hell of a ride! Earth Unaware follows three main story lines. The first, and most important, is that of seventeen year old Victor Delgado onboard the El Cavador, a family-run mining ship eking out an existence in the Kuiper Belt. Then there’s the ruthless Lem Jukes onboard the Makarhu who will stop at nothing to prove himself to his father, the founder of Jukes Enterprises, the largest space-mining corporation in the solar system. Lastly, back on Earth, there’s Wit O’ Toole, the leader of the Mobile Operations Police - an elite peace keeping force tasked with training for any eventuality. It took me only 19 pages to be completely engrossed in the story. Card and Johnston manages to fill the novel with such well-crafted and believable characters that you are emotionally invested in their lives almost immediately. The novel kicks off with a pivotal moment in Victor’s life when Alejandra, his second cousin and childhood friend, is sent away due to fears that they might be falling in love. From that point onward I was completely hooked. Why? It’s simple - the attention to detail which brings the whole world to life. The authors went so far as to imagine how relationships/marriages would work for these isolated miner families. Inbreeding is seen as the ultimate taboo which, should it be allowed, would put the entire family into disrepute and make them outcasts amongst the miner community. The world-building is top-notch and the amount of thought that went into portraying the dangerous and isolated life onboard a space-mining ship and the entire infrastructure needed to sustain the miners really stood out. The vastness of space is used to great effect and throughout the novel you are constantly reminded of just how perilous life at the fringe of the solar system is. After the El Cavador detects a mysterious object entering the solar system things come to a head and the pace picks up considerably. There’s never a dull moment and the action sequences, especially those with the Formic encounters, will have your heart pounding. The pages just flew by and towards the end I reached a stage where I slowed my reading just to make the novel last a little bit longer. Ultimately this is the story of how a disparate group of individuals facing insurmountable odds band together in order to ensure the survival of the rest of the human race. They don’t hesitate to sacrifice themselves for the greater good. To borrow from the afterword – “We knew from the get-go that we weren’t writing Ender’s Game. This wouldn’t be the story of a single hero; it would be the story of many”. And that’s precisely what it is. Since this is the first novel in a trilogy the ending leaves lots of things unresolved, but there is enough closure to make it a satisfying read. 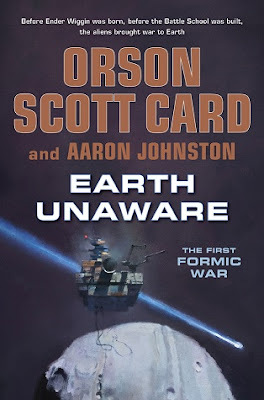 Earth Unaware stands well on its own and with the Ender’s Game movie currently in production it might just be a good entry point for a new generation of Ender fans. My only complaint is that there seems to be the potential for a rather large discrepancy in continuity with the events in Ender’s Game, but I’ll have to wait to see what happens in the rest of the trilogy before I can tell if that’s in fact the case. Earth Unaware is a stunning read filled with fascinating characters, lots of suspense and emotional turmoil that will have you at the edge of your seat. You don’t need to have read Ender’s Game to enjoy this, but for fans this will be a welcome return to the Enderverse. If you read only one science fiction novel this year it should be this one. Tor has unveiled the title and cover for the final installment in the Forerunner Saga written by Greg Bear. Based on the popular Halo videogame franchise, the novels tell the story of the Forerunners, the original creators of the Halos. I enjoyed both Halo: Cryptum and Halo: Primordium and can't wait to see how things finally turn out. In Halo: Cryptum, Greg Bear began a three-book arc set in the era of the Forerunners, the ancient and enigmatic creators and builders of the Halos, which continued in Halo: Primordium. Now, in the last years of the Forerunner empire, chaos rules. The Flood—a horrifying shape-changing parasite—has arrived in force, aided by unexpected allies. Internal strife within the ecumene has desperately weakened Forerunner defenses. Only the Ur-Didact and the Librarian—husband and wife pushed into desperate conflict—hold the keys to salvation. Facing the consequences of a mythic tragedy, one of them must now commit the greatest atrocity of all time—to prevent an unmatched evil from dominating the entire universe. 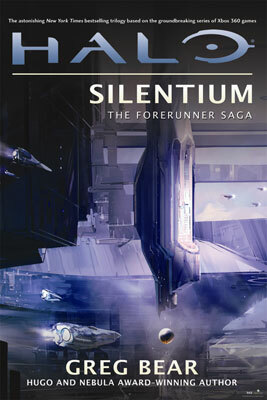 Halo: Silentium will be released on January 8, 2013. It seems I just can't keep up with all the great books being released in the coming months. 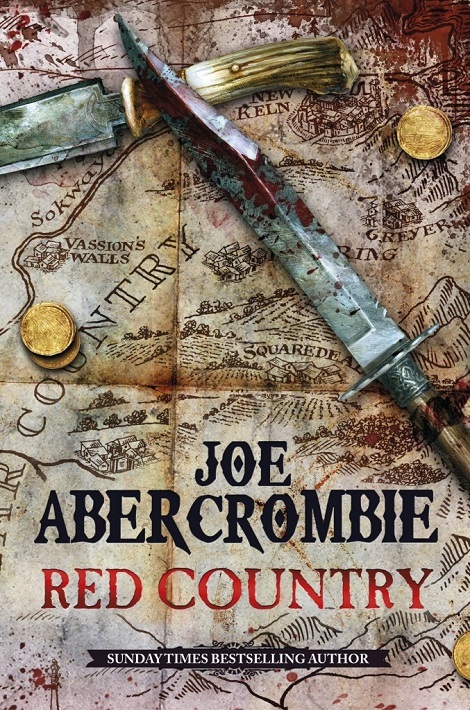 Gollancz unveiled the UK cover for Joe Abercrombie's Red Country today. Stylistically it fits perfectly with the rest of the books in the series. Those blood-spattered, weapon-laden maps just shout Abercrombie and they have become somewhat of a signature for his books (at least for the UK versions). Their journey will take them across the barren plains to a frontier town gripped by gold fever, through feud, duel and massacre, high into the unmapped mountains to a reckoning with the Ghosts. Even worse, it will force them into alliance with Nicomo Cosca, infamous soldier of fortune, and his feckless lawyer Temple, two men no one should ever have to trust. . . The past never stays buried . . .
Red Country will be released in October and is currently available for pre-order. A secret army of Orcs, made immortal by the hidden powers of the Black Water, now marches towards Girdlegard, set to unleash its fury upon the kingdom. Sooner than they realize, Tungdil and his comrades will need to summon all their courage to do battle against this bloodthirsty horde. Starting a new series is like getting a brand new toy. The pages sparkle with infinite potential – a new world, new characters and new conflicts await discovery. You devour the pages at a frantic pace and all too soon you reach the end. By the time you get to the second book the sparkle has faded and the world is no longer quite so exciting. Without the benefit of rose-tinted glasses you start noticing the cracks in the pavement, the dust swept into the corners and the hastily patched holes in the furniture. Unfortunately that was the case with The War of the Dwarves. While I enjoyed the first installment the sequel just didn’t measure up. It took me just over a month of active reading to finish the 716 pages. Normally I’m a fast reader, but lately I’ve been suffering from reading fatigue so I read this on a sporadic basis. The thing is, up until the last 100 pages, I was never engaged to such an extent that I couldn’t put the book down and continue with something else – never a good sign. As with The Dwarves, the plot is pretty straightforward and the few twists are fairly predictable. I can see how this might make the story more accessible to casual readers, but serious fantasy fans will find it a tad too simplistic. 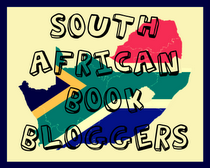 Where the novel really disappoints this time round is with the characters. They seem emotionally stunted to an infuriating degree and, for the most part, their actions (and reactions) just didn’t ring true. It felt as if the characters were being dragged along to fit the plot, and not that the plot developed in response to the characters actions. One example of this is where Tungdil is betrayed by someone and he just shrugs it off in order to face the threat to Girdlegard. This is no small betrayal and I would have expected him to be completely devastated as a result. Century old feuds, which played a large role in the first instalment, are also set aside far too easily for my liking. Heitz follows in the footsteps of George R.R. Martin by killing off some major characters, but in this case it’s used as an easy way out of resolving conflicts. The deaths don’t seem to have much of an emotional impact on the rest of the characters or, with the exception of one or two, the reader. The last 100 pages or so offers a much needed redemption for the rest of the novel. The ending is riveting and action-packed. It ends on a happy note with a truly poignant moment or two. I only wish there was more of this earlier in the novel. 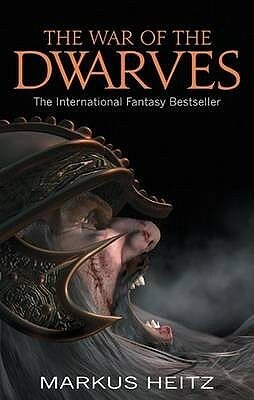 The War of the Dwarves isn’t a bad novel as such. It has its moments and turned out to be an enjoyable read overall. It feels geared more to the casual reader. If you are looking for a light, entertaining escape into fantasy this might be for you. I'm slowly clawing my way back out of the reading fatigue I've been suffering from for the last couple of months. Trying to catch up on everything that has happened in the world of science fiction and fantasy is no easy task, but I'm getting there. 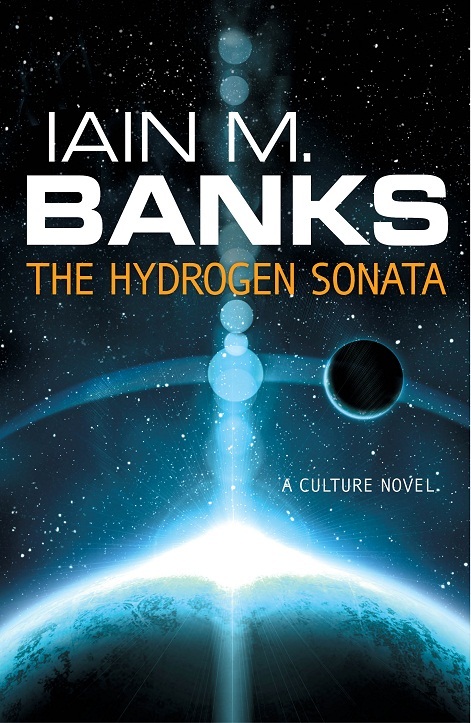 One forthcoming release I'm extremely excited about is the new Culture novel from Iain M. Banks, The Hydrogen Sonata, which will be released in October. The cover looks fantastic (I'm a sucker for a good space scape) and the premise seems interesting. Amid preparations though, the Regimental High Command is destroyed. Lieutenant Commander (reserve) Vyr Cossont appears to have been involved, and she is now wanted — dead, not alive. Aided only by an ancient, reconditioned android and a suspicious Culture avatar, Cossont must complete her last mission given to her by the High Command. She must find the oldest person in the Culture, a man over nine thousand years old, who might have some idea what really happened all that time ago. It seems that the final days of the Gzilt civilization are likely to prove its most perilous. This one is definitely going on my wishlist.